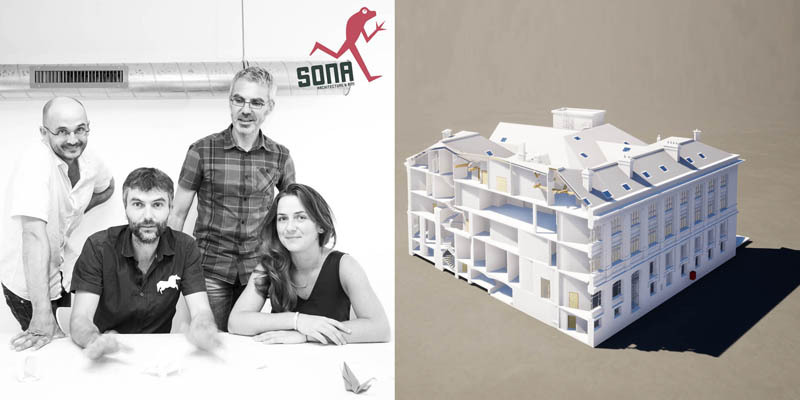 On Thursday, October 18th, manufacturers and construction professionals attended the presentation of Emmanuel Sorin, architect and co-founder of the agency SONA, at Polantis’ facilities in Nantes. Moreover Camille Foucher (developer and integrator of 3D Unity in augmented reality and virtuality at Bloc in Bloc) and Arthur Rousseaux (managing partner of Liber – D) talked about their work on the presented projects. Emmanuel Sorin wanted to give the morning a special meaning: He presented an overview of projects to the audience in order to show that the digital model is an aid to all projects if we know the objective we want to achieve. He started his presentation with a comparison: Why use the point cloud to make an inventory and what are the advantages of using this approach compared to a 2D method? little guarantee on the sales areas, little means of communication, the delivery date is uncertain, etc. there may be delays due to unforeseen circumstances, understanding is sometimes difficult, etc. fast, complete and controllable (360 shots, easy access to information), with little or no error, accessible, it does not need any additional inventory, etc. 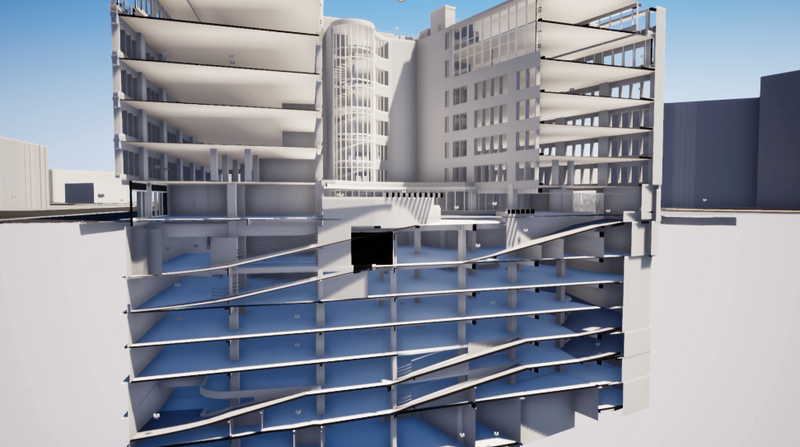 As part of its modeling process, the agency SONA works with three software programs: Scene (software for 3D documentation from FARO), ReCap (reality capture and 3D digitization) and Revit Architecture. Scene allows you to choose the starting point of the height measurement, the ceiling height, the height of the stringers, the dimensions of the built elements. Recap allows you to clean up the points and create zones. It allows the zones of a document to be linked: each zone can be identified and geolocalized using a URL. If these steps are not followed in advance, modeling will be poor, and the inventory will ultimately not be reliable. After this technical excursus, Emmanuel gives an overview of each project and the benefits of the BIM for each situation. In order to understand the structure of the building and the benefits of part of the facade, the architect requires modeling the building in two “parts”. One includes the part to which the question relates, the other does not. Thus, building rehabilitation research may be performed with or without reference to that part of the structure. 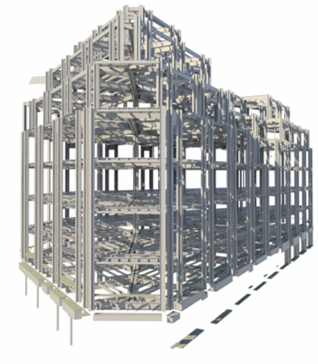 If the builder needs to revert to the modeling here (next phase, the point cloud), that’s because it was useful to integrate the intelligence of the engineer, who said “this must be like that, even if we’re not sure”, in addition to the simple inventory. Artelia asked the agency SONA for an analysis to find out how machines can be exchanged in a factory. The building shows many obstacles to the project (elevator, ceiling height of 1,70m …). How can this project be best organized? Will the size of the machines be problematic? In this case, we move away from the work of the architect. SONA’s work here provides a dimensional guarantee: the digital model allows the transition to a technical investigation. The inventory of the skeleton building of the “shop 3” (concrete building with metal skeleton construction) of the Samaritaine, former Parisian department store, was problematic. In order to obtain a detailed structure, the builder commissioned SONA to scan the entire building. After completion of the work, each bearer received an identification number, which allowed the architect and the design office ‘Structure’ to define – for example – the bearers that were the first to be relevant to the refurbishment of the building. In this case, the model created by SONA was used as a diagnostic tool. A tool for decision making, a technical examination, a diagnostic tool or even an augmented reality for museums, communication tools … the digital model can be used in many ways: the important thing is to define the goal of the modeling before starting the modeling itself. As a rule, the more expensive the land, the more likely the client will use BIM to support his project.